We hope you enjoyed the experience of building your first RPA robot. And you’re probably wondering what next steps you can take to learn more about Kofax RPA. Check out our recommended training courses below, designed to educate and prepare you for your future with Kofax RPA technology. 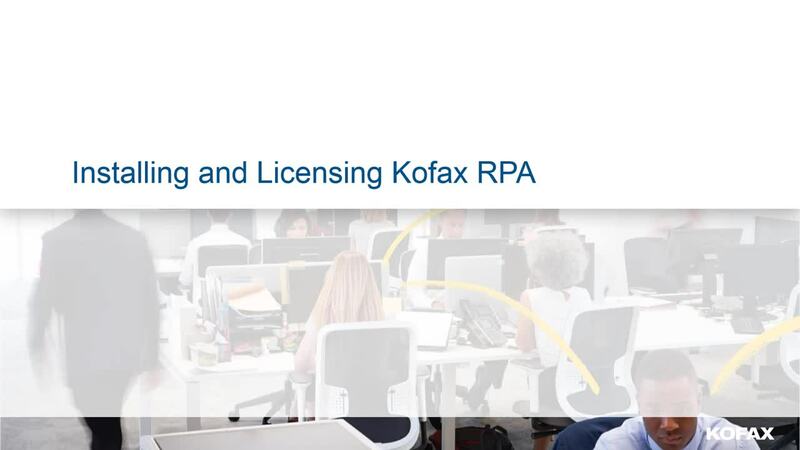 Kofax offers additional product training designed to increase your knowledge and proficiency with RPA. We recommend that you begin by attending our free-of-charge Introduction to Robotic Process Automation (RPA) on-demand training next. This short (1-day) course is designed to provide an overview of Robotic Process Automation using Kofax RPA. Our on-demand delivery allows you to stream this informative, self-paced training course anytime from anywhere you have an Internet connection. Click here to enroll in our complimentary Introduction to Robotic Process Automation (RPA) training course. Want More? The fun doesn’t stop there. For those seeking a comprehensive understanding and the knowledge necessary to install, configure and administer Kofax RPA, develop your own robots and receive your product certification, check out our Kofax RPA Training and Certification training course. Want to Get Kofax RPA Certified?